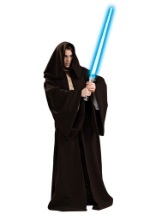 The Darth Vader authentic adult costume is the ultimate costume for the ultimate movie villain character. This Star Wars collector's edition costume has everything you need to become Darth Vader. Requires 8 AA batteries - not included.